I've purchased this book manly because it is about a governess and because of the title. The story is a bit dark, set in the year of the Queen's Jubilee. Catherine and her sister are left penniless once their father passed away. Catherine is a strong woman who decides to work as a governess for a little girl who is pretty much ignored in her family. The life is of this girl was so similar to Colin's from The Secret Garden. The book is a bit gloomy; Catherine's new life is hard and sad. She and the girl (Amy) are practically starving, the house is dark and damp; they are alone. Catherine's sister is an ungrateful selfish brat. The mystery is not really a mystery since we know from around half of the story what is going on. Mr. Ravensbourne is nice but very irresponsible. This was my first and only book by this author. It had little bit of mystery and little bit of romance. It was an engaging read, despite the fact that mystery of the former MRS Ravensbourne when revealed was a little bit tame. It is more like in the fashion of Jane Eyre. The Story revolves around Catherine and her younger sister who are left penniless after their parents death. Catherine takes up a job as a companion of an old aunt of her betrothed( not really engaged but her earnest admirer). The aunt unfortunately likes her younger sister and gives the job to her. Catherine needs a job and fast. That's how she ends up in Ravensbourne to look after the young girl. Mr Ravensbourne is very stern yet kind man and they both end up having a happy ending together. 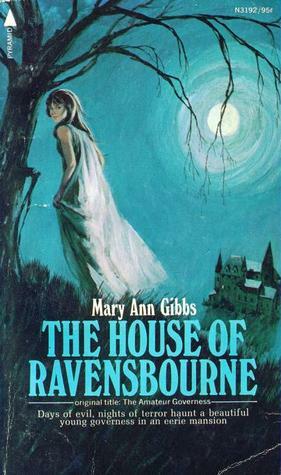 Mary Ann Gibbs - Pseudonym for Marjorie Elizabeth Sarah Bidwell. AKA Elizabeth Ford.